Fairfax photographer Alex Ellinghausen captured this moment when, well, I am yet to hear any good explanation for what is happening. As you can imagine, the bizarre photo has been gratefully received by political junkies on social media, myself included. Its is simply Abbott meeting a family as he toured a factory. But if Rudd is a chronic nerd, Abbott is an expert at gawk. The leader of the Liberal Party seems to have a knack for leaving his mouth gaping, for showing his bare chest and for looking down his nose at journalists. To these skills, we can now add hair-sniffing. If you re-live that horrendous minute of silence Abbott shared with Channel 7’s Mark Riley, you’ll notice Abbott can make at least two of those mistakes at once. By this point, we must assume that no amount of media training will solve the dilemmas Tony brings to media appearances. His avoidance of an interview with Leigh Sales – he was eventually interviewed by Sales’s colleague Chris Uhlman after months of requests – suggests that the presence of women only exacerbates his problems. The critics of Abbott on Reddit enjoy hashing over the moment, again on 7.30 Report, when he let his guard down and conceded some speeches are fudged, not a true reflection of his position, not ‘gospel truth’. Go on, re-live it. The nodding?! Why is he nodding! I feel certain that to meet Abbott is to encounter a man with good social skills but a poor sense of personal space. He may have more in common with Mark Latham than Kevin Rudd. Abbott even reminds me of Bob Hawke, with his tendency to “aaahhhh” his way out of answering any question quickly. 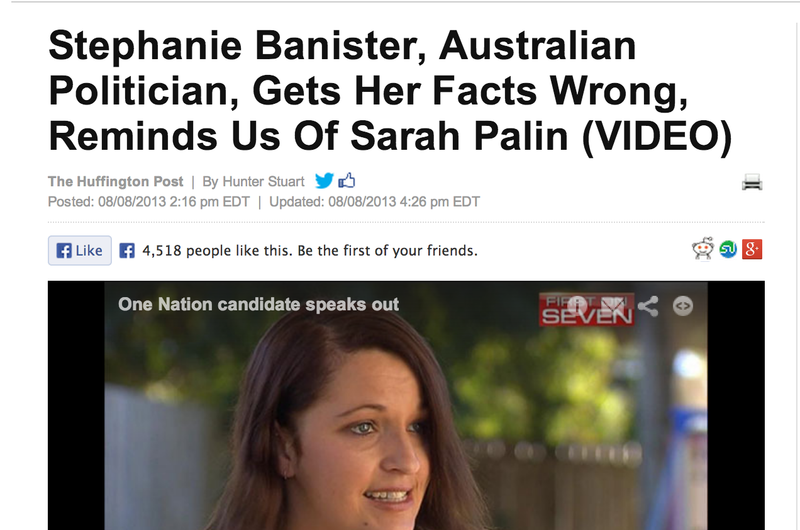 It is time for One Nation to change their name to FacePalm. 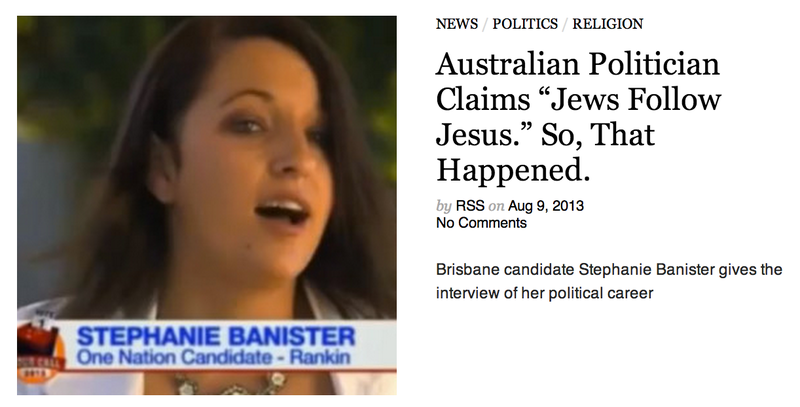 Stephanie Banister, the One Nation candidate for the Queensland seat of Rankin has become this week’s real political star. The only thing more astounding than her factual errors are the basting she has received from international media. electioneering in the social domain, it’s only fair that we cast judgment on their strategies (or lack thereof). The potential for awkwardness, hilarity and/or humiliation is very high. And that’s just within this blog. Channel 7 reporter Alex Hart uncovered a certain level of awkwardness in political videos previously reserved for Rudd’s off-the-record rants or Tony Abbott’s minutes of silence. Enjoy it – or, at least, watch it. Bernadette wants to be cool. Her first barrier to having us believe this is her first name. She’s your aunty who wants to be your best friend despite forgetting all your birthdays and re-gifting you some crap from CopperArt. She then describes your particularly non-rockstar lifestyle in ho-hum suburbia, punctuated only by realisation your dreams are unattainable (cue Liberal three-word slogans). Also, she says ‘LOLCATS’ out loud. Bernadette is big L Liberal with tragically small production values, broadcasting from a world of macro-suede, friends called Suzie and dreams of making a difference beyond her weekly bookstall down the arcade. Despite the fact it was posted on his party’s Facebook page one week ago, Fred Nile’s Australian Christian Democratic Party gained considerably more attention today when it was spread more widely on twitter. Nile’s team pushes a very conservative Christianity agenda using techniques as old and tired as I imagine his average supporter is. The decision to focus on divisive issues and approach them with bitterness means that his efforts online will never resonate widely. Indeed, In the context of social media context where messages need to be truncated, Fred’s approach replaces any complexity or nuance with cheap, often offensive one-liners. I think that the result of his approach will be to narrow his appeal – even while his posts may get enormous reach within social networks. This is an example of a post everyone feels safe to retweet without fear of people thinking you endorse the views. Let me know of you see any good or sensationally bad examples of social media campaigning in the next five weeks. Such a shame it’s not eighteen months like in the US. When Tony Abbott made himself available via Twitter this afternoon to answer questions, the social network let loose like a classroom left alone with a casual teacher. That’s not to say it wasn’t enjoyable but real questions were few and far between. I, for one, support the idea of such real accessibility. Let’s hope we see more of it from our politicians – because as long as it’s a rarity, it’s only good for entertainment value…. @maevegobash: Which douchebag staffer told you that doing an #AskTony thing on twitter would make you seem hip and approachable?